Named due to its resemblance to the farming implement, the original and most famous of this type of anchor is the "CQR" anchor. Patented in 1933 by the Geoffrey Taylor of the United Kingdom, the plow anchor quickly became a favorite as the primary anchor for larger pleasure vessels. The CQR anchor was designed as a single fluke anchor with extra weight being placed in the tip of the fluke. This extra weight in the tip was to aid the anchor to dig in quicker and set faster while the fluke itself provided resistance to dragging once the anchor was set. The largest drawback to the plow is due to its design and weight. 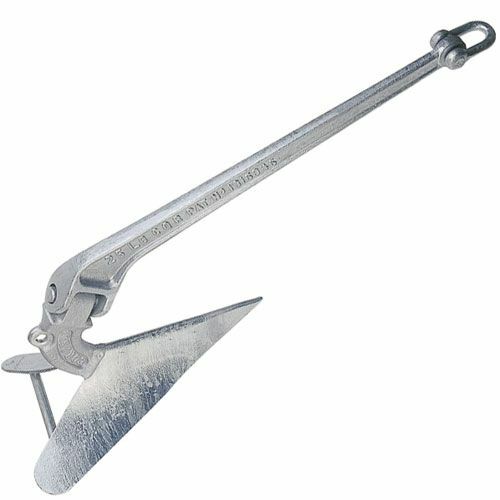 The plow style anchor, whether articulated or fixed shank, are not easy to stow or handle. An anchor roller platform is almost a must have item to conveniently stow and have the anchor available for immediate use. Much like the Danforth LWT anchor, the "CQR" because of its popularity, has been copied and manufactured by many different companies. The British firm Lewmar now owns the original CQR name and design. So Why Does The Shank On A CQR Anchor Pivot?? Over the years, there has been a lot of misunderstanding, dockside gab sessions, and probably even a few heated watering hole discussions about this topic. So let’s try to clear up the misconceptions! Quite a few out there including some of the "Anchor Experts," feel that the design was to allow a vessel riding to a CQR anchor the ability to swing on her anchor to a greater degree before causing the anchor to break out. The only reason behind this particular design concept was to allow the fluke of the anchor to right itself and to remain in the correct position when setting the anchor or when the anchor is dragging. "The provision of the hinge between the two portions of the shank-which is an essential of the invention, ensures that in the first place, when the anchor falls on the ground or when drag is initially applied, the fluke will take up a position such that it will tend to dig into the ground. The hinge thereafter ensures the automatic righting action of the fluke and the maintenance of substantially stable conditions during the continuance of drag." The original "CQR" has always been well regarded as a good general purpose anchor and remains well thought of by many cruising sailors around the world. While not up to par with the most recent of anchor designs, it is known for its ability to be used under many different bottom conditions and generally proves to be adequate for the job. The use of drop forging in some models has also provided additional strength in the critical fluke areas. You can compare sizes and pricing here: CQR Anchors @ Amazon or CQR Anchors @ West Marine . With the introduction of the "Delta," the plow anchor took a giant stride forward. 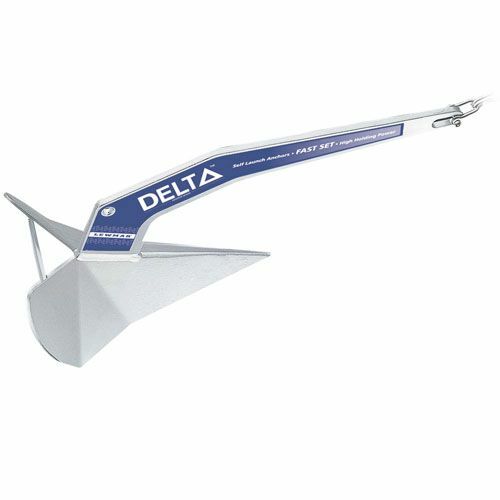 Delta offered a vast improvement in plow anchor technology. Developed in the 1980s by Simpson-Lawrence, it maintained a striking resemblance to the original CQR. The first thing you will notice is that the shank is now fixed, the shank geometry was also changed to force the tip downwards during setting. This downward force as well as retaining the weighted tip purportedly aids in quicker sets. The fluke has an increased surface area and now flares outward at the rear to provide more resistance to dragging and twisting forces. Because of this re-designed geometry, the Delta is reputed to have a slightly superior advantage in holding power over the CQR. You can compare sizes and pricing here: Lewmar Delta Anchors @ Amazon or Lewmar Delta Anchors @ West Marine . When I began thinking about listing the pro’s and con’s of the plow anchor, I first began considering my own experiences. But what if I was just lucky (or unlucky) as the case may be. Maybe my personal experiences did not have enough data points to be a fair evaluation. With that thought in mind I decided a search on the "Pros and Cons of Plow Anchors" was in order. So much for the experts! Now, after reading all of these comments about the best and worst in plow anchors, I may be better off getting a slip at the local marina. My quick interpretation of these results added to my own personal experiences is that a plow anchor appears to work well in sand and mud bottoms; everything else is a crap shoot! The Lewmar CQR and Delta Anchors are available in galvanized or stainless steel. The CQR is available in sizes from 9 pounds (4 kg) to 700 pounds (318 kg) while the Delta Anchor can be found to 140 pounds (63 kg.) The CQR manufacturer’s specifications and sizing chart can viewed or downloaded here. The Lewmar Delta Anchor manufacturer’s specifications and sizing chart is also available to view or download.